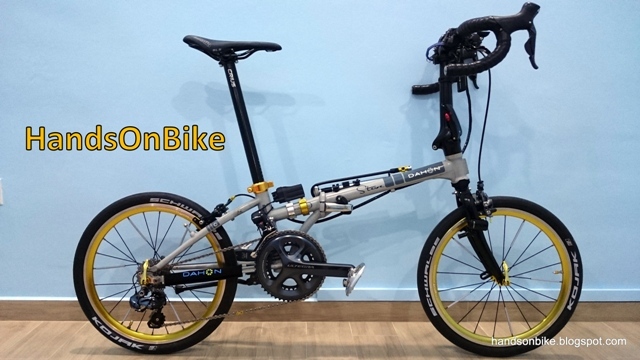 When you run out of things to modify on your primary bike, it is time to get another bike to zhng! And the Flamingo London NX7 is the one. As it is meant to be just a commuting/leisure bike, I don't forsee a need to upgrade the parts on the bike. However, sometimes your hands just get itchy and you want to change something on the bike. This time, I am not calling it an upgrade, as it does not really offer any performance boost or weight loss. Rather, I call it a modification as it is merely an alternative to the current part. The stock roller wheels that come with the bike is not of very good quality. Although it does not roll very well, what I feel is not acceptable is that the wheels are not round enough. 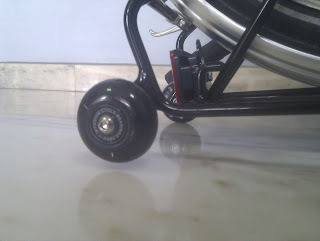 There are small dents and bumps on the circumference of the wheels, which makes pushing the folded bike quite wobbly. I decided to get the Ezy Wheels from Thecyclopedia to give it a try and see if it improves the rolling of the folded bike. My first reaction when I received the wheels was "Why are the wheels so tiny?!" From the pictures on the website I thought they would be of a similar size to what I currently have on the Flamingo, but I was wrong. The original roller wheels are 65mm in diameter, the Ezy Wheels are 47mm in diameter. In any case, since I already have the wheels, I might as well put them on and give it a try. Because of the small size, this means that I can only put on one pair! I can put on the Ezy wheels on the tail end of the rack, but not at the end where the suspension block is. Suspension block is close to ground even with the original large roller wheels. For this end of the rack, I will still use the larger original roller wheels, as the suspension block is already close to the ground. When I tilt the bike upwards to clear obstacles, the block will sometimes touch the ground. Because of this, I cannot change the roller wheels on this end to the smaller Ezy Wheels. As for the other end of the rack, I can change the wheels to the smaller Ezy wheels to give it a try. Smaller Ezy wheels on the other end of the rack. 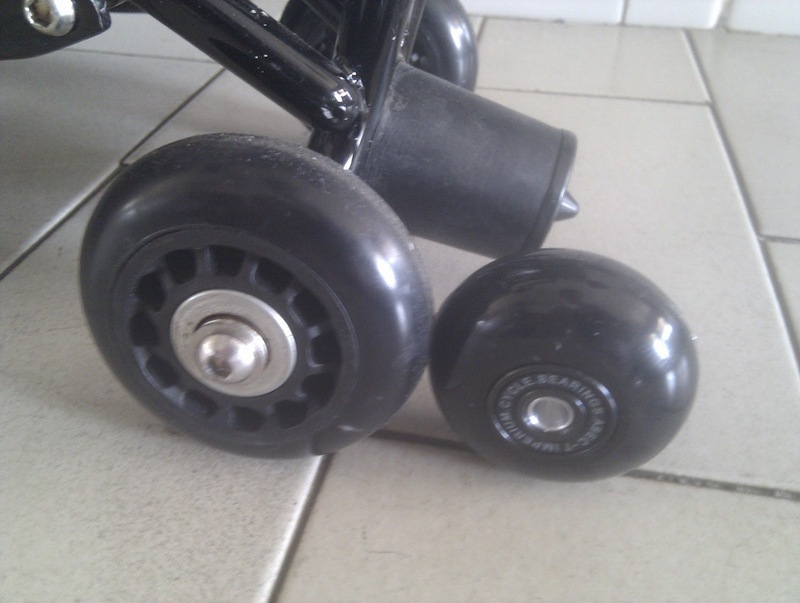 This particular wheel does not touch the ground as the 4 wheels are of uneven height, even with the original roller wheels. 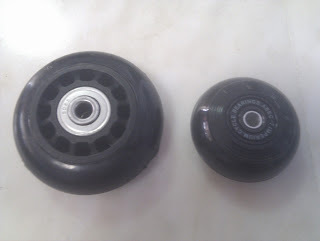 2 smaller Ezy wheels and 2 larger stock roller wheels. 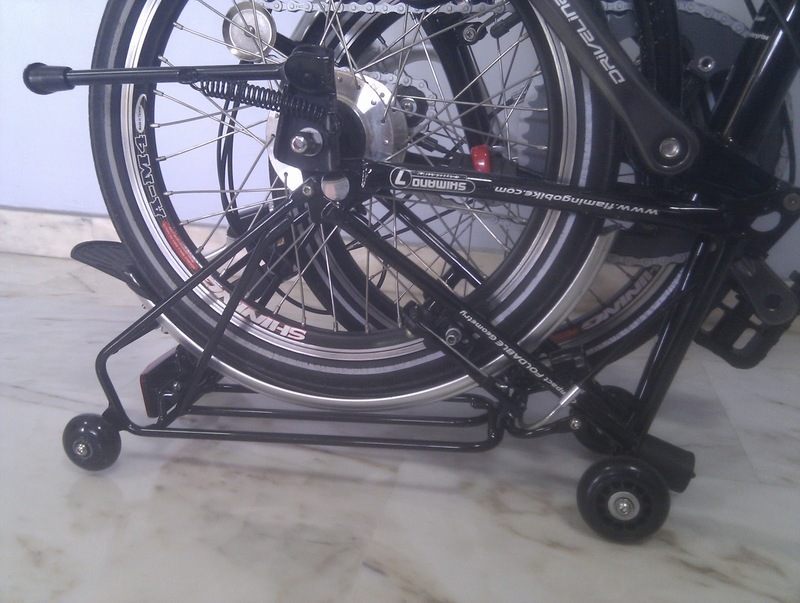 With this setup, the bike tilts slightly downwards at the front when folded. 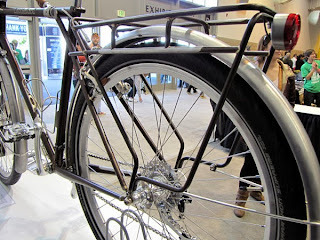 This is not necessarily bad as it slightly lowers the folded height of the bike. 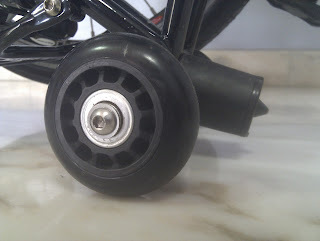 What I noticed is that the Ezy wheels do roll better on flat ground, as the wheels are rounder and the bearings are smoother. However, the smaller wheels do not roll over obstacles as well. Examples of obstacles that I come across every time are the metal dots/strips that line the floor of the MRT stations. The bike really judders a lot when I roll the bike across these dots/strips. A larger roller wheel will roll over these obstacles much more easily, just like how a 26" wheel MTB will roll over obstacles better than a 20" wheel bike. Another issue I noted is that these smaller wheels sometimes get stuck in the groove at the lift doors. Although rolling on flat ground is smoother, I lose the ability to roll over obstacles easily. I find myself needing to tilt the bike upwards more frequently, in order to lift the front end over obstacles. Depending on further evaluation, I may decide to change the wheels back to the original roller wheels. 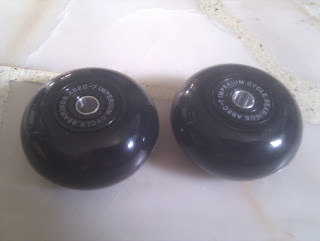 Or I will have to get better quality roller wheels that are of similar size to what I have currently. Hi there! Recently bought a Flamingo London. I've been reading your posts and just want to thank you for what your doing as you're giving me ideas on what to do and not to do :-) with my bike. Also hoping to read from other Flamingo bike owners too. Again thanks and more power to this blog.